The marquise cut (also called, "navette") is an elongated shape with pointed ends inspired by the fetching smile of the Marquise de Pompadour and commissioned by the Sun King, France's Louis XIV, who wanted a diamond to match it. It is gorgeous when used as a solitaire or when enhanced by smaller diamonds. The marquise cut diamond (also called, the "navette" cut diamond) is an elongated shape with pointed ends. The cut was developed for France's Louis XIV who, so enchanted by the fetching smile of the Marquise de Pompadour, commissioned the development of a diamond to match the smile. The marquise cut is gorgeous when used as a solitaire or when surrounded by smaller diamonds and gemstones. 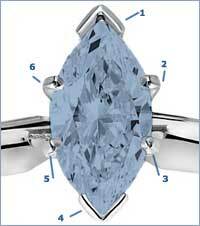 When purchasing a marquise cut diamond online, be sure to check width and length. The length/width ratio is the number that tells you how "skinny" or "fat" the diamond is when viewed from the top. For a traditional marquise cut, select a diamond in that falls in the 1.75 - 2.25 length/width ratio. While not the traditional selection, marquise cut diamonds are an elegant stand out from the more common round brilliant generally selected for engagement rings (either as a solitaire or with accent stones). Marquise cut diamonds require specialized settings — particularly with added prongs to protect the points of the diamond. The example here shows a six prong setting. Four prongs support the bulk of the diamond and the two additional prongs support and protect the fragile point. To give you some ideas of what's available for a marquise cut diamond ring, we've preselected a range of certified marquise cut diamonds for you to examine (all from James Allen and Blue Nile, two premiere diamond stores). Except for the "Bargain Basement" selections, these diamonds are within our minimum requirements as listed above and are suitable for solitaire settings or settings with accent stones.